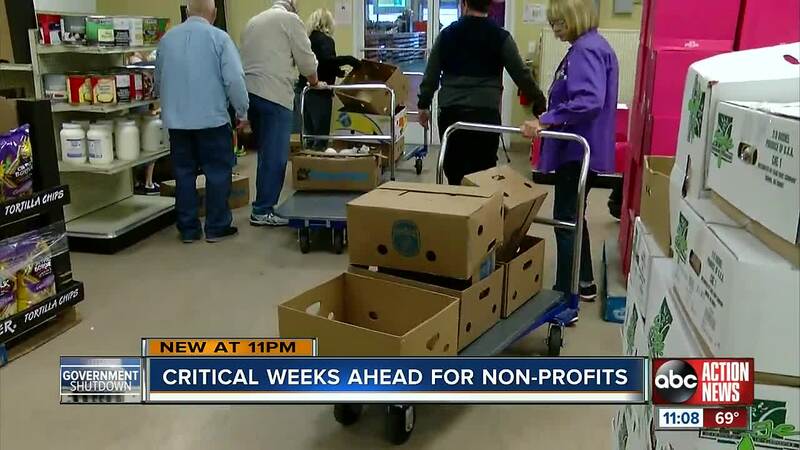 The government shutdown has been over for seven days, but local non-profits continue to report an increase of federal workers in need of assistance. The historic 35-day shutdown, the longest in U.S. history, pushed many people into debt, or deeper debt. The impacts on our community were compared to a hurricane. The Salvation Army continues to report more and more calls for assistance. Feeding Tampa Bay is also making pleas for help and more donations via social media. A recent Facebook post said, “hundreds of thousands of individuals in our community go hungry every day - and this number has only grown in recent weeks. We are expanding our services to meet this demand: hosting a food pantry on premises at our Winn-Dixie Charity Market, organizing additional mobile pantries each week, and offering prepared meals and hot meals through Trinity Cafe." On Feb. 2, Feeding Tampa Bay will open their Winn-Dixie Charity Market from 10 a.m. to noon at 4702 Transport Drive, Bldg 6, Tampa, FL 33605. For a complete list of resources click here. Ivery said they helped more than a thousand people during the government shutdown. They are working on contingency plans in case negotiations between Republicans and Democrats fail. The deadline to reach an agreement on border security is Feb. 15.